Although the weather has dominated my thoughts and a lot of my actions all day (I spent probably a couple hours trying to dig out the vehicle, just because I know I will have to move it tomorrow – if it starts), I tried to make the best of the weekend yesterday by swimming before it became impossible to travel to the pool, stocking up on soup ingredients, and cooking comfort food. Sleep overtook me while going through pictures on the futon, but I managed to find these few whimsical images for a post. 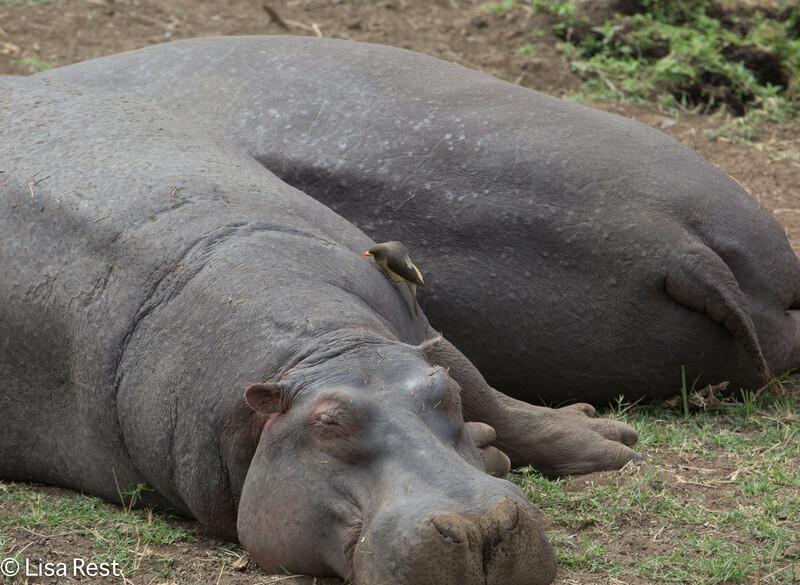 Maybe it was the images of sleeping hippos that did me in. I sometimes have zebra finches pecking at me instead of oxpeckers. Those of you in the path of the arctic blast, stay safe and warm and think warm thoughts. 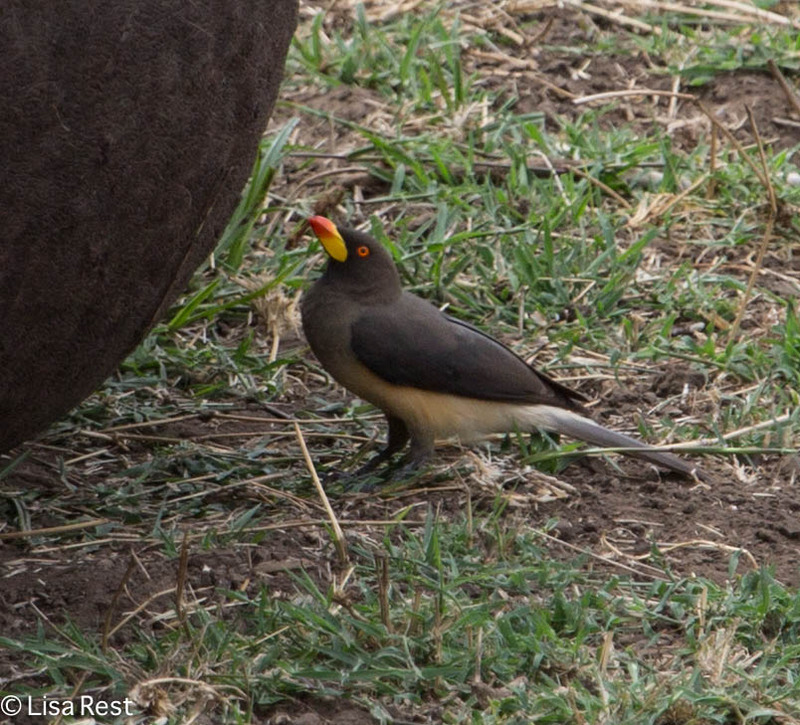 This entry was posted in birds, photography and tagged East Africa, Hippopotamus, Tanzania, Yellow-Billed Oxpecker by Lisa Rest. Bookmark the permalink. Those are wonderful pictures! 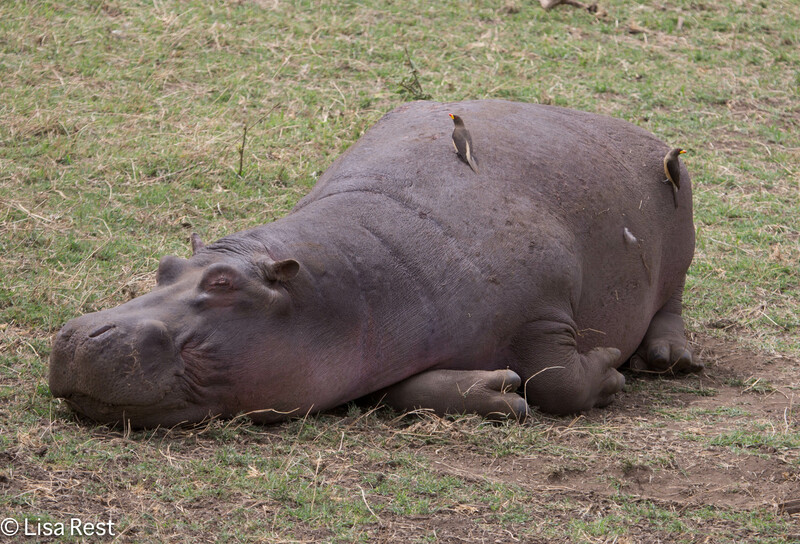 The hippos look so contented and peaceful, though I have read they can get quite belligerent and fast when they want to be. Ha. It started, and I got lots of exercise digging it out. What an adorable hippo! Wait, is that an oxymoron? Even that big fella produced an “aw” here, and I always get a kick out of those helper birds. Plus, it was wonderful to see photos from a warm land on this cold day. I’m concerned about the roll this weather must be taking on the birds, not to mention humans! I read yesterday about the extremes in Australia (122 degrees – bats dropping dead out of trees, and I have a place in my heart for those beautiful flying foxes) and Brazil (120 degrees) – it’s really, really hard to be optimistic these days. But the days are getting shorter. I have had cardinals singing in the past week…and Black-Capped Chickadees too, although that’s not quite as unusual, I still appreciate it!